The former Wales and Lions rugby captain has travelled the world watching rugby and talking about the game since his retirement in 1978. There is no more authoritative voice in rugby union today and Bennett’s book will tackle a host of issues dominating the sport in the modern era. When Prince Charles watched Llanelli play the All Blacks on their last meeting in 1997, he claimed he had the best seat in the house – the one next to Phil Bennett. Such is the esteem in which the ex Wales and Lions captain is held, it's no wonder his frank opinions and hard-hitting appraisal of the sport he lives and breathes continue to have as much impact now as they did when he was the world's premier fly-half in his seventies heyday. In his book Bennett is scathing of the Welsh rugby administrators, poor standards of coaching and the failure to embrace new ideas. On a global level he has strong views on professional rugby and the rise of the European game. 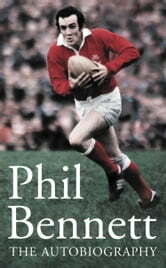 This makes a fascinating contrast with Bennett's career as a player in the Seventies – the glory years of Welsh rugby – when the likes of Gareth Edwards, Gerald Davies and JPR Williams would dazzle the public with their breathtaking skills and scintillating tries. Bennett recalls how opportunism on the field was matched by bonhomie and revelry off it in the amateur days when pints took preference over practice. Bennett continues to be heavily involved in rugby through his work for BBC TV. And his influence on the game remains to this day.